This toolkit builds on the success of classroom presentations conducted by the Noisy Planet team at schools within the Washington, D.C., metropolitan area, and offers key resources and tools to teachers, school nurses, and other educators across the country. Start here by downloading Teacher Toolkit instructions. Download this sample presentation and script to guide you through the Noisy Planet classroom activities. These four training videos show the activities included in the presentation. Instructions provide in-depth descriptions of each activity, including the required equipment, number of student volunteers needed, and the estimated time for each activity. Learn how to conduct the Tuning Fork Activity, which demonstrates sound vibrations. Download the instructions to learn more about this activity. Learn how to conduct the How We Hear Activity, which engages students to act out the sequence of events involved in hearing. 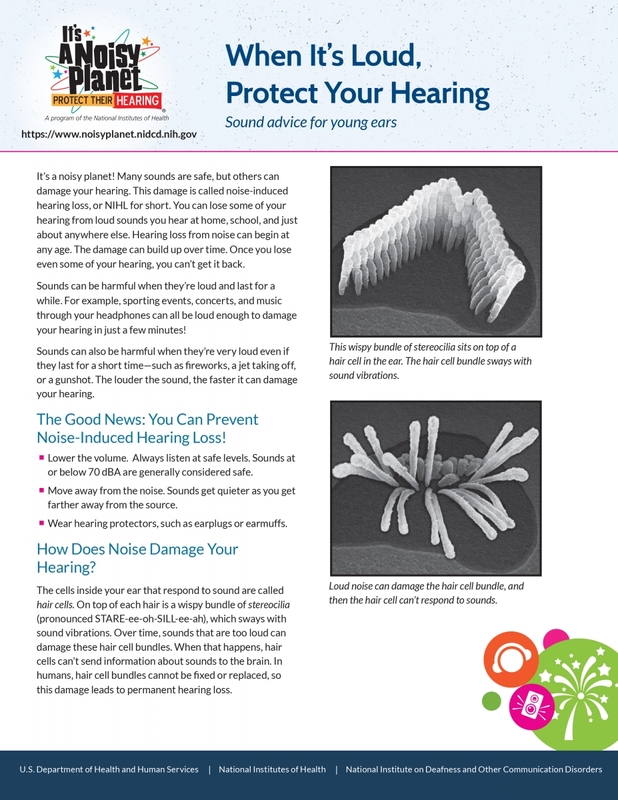 Learn how to conduct the Hair Cell Activity, which shows students how loud noises can damage hair bundles in the inner ear. Learn how to conduct the Blow Dryer Activity, which demonstrates the benefit of moving away from the source of sound. Find additional free Noisy Planet educational resources to download, print, and order. These resources can be used before, during, or after presentations, and can be shared with families to reinforce key messages. 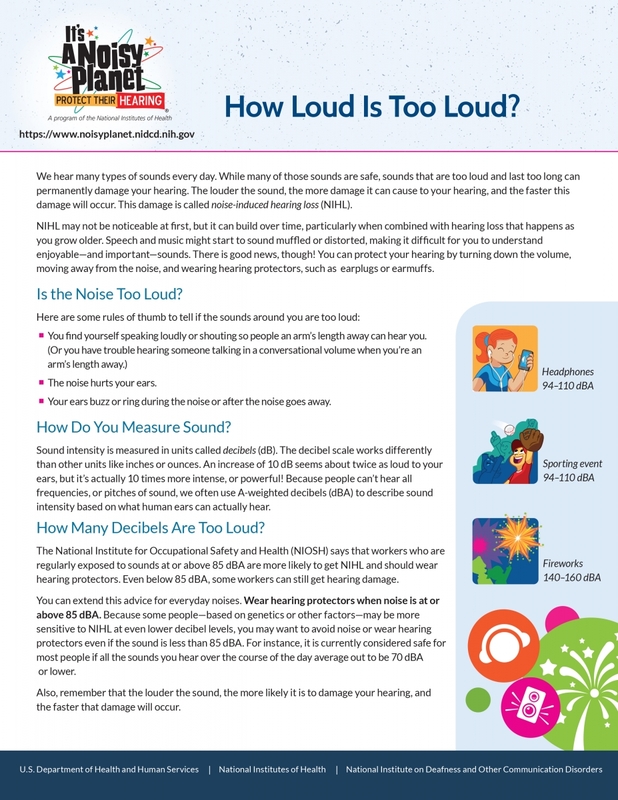 Resource for kids that explains how noise can damage their hearing, prevention of noise-induced hearing loss, how loud is too loud, and types of hearing protectors. Kids can test their new knowledge with a crossword puzzle included in the publication. Learn how sound is measured, what sounds are too loud, how to protect your hearing, and how to teach kids about healthy hearing habits. 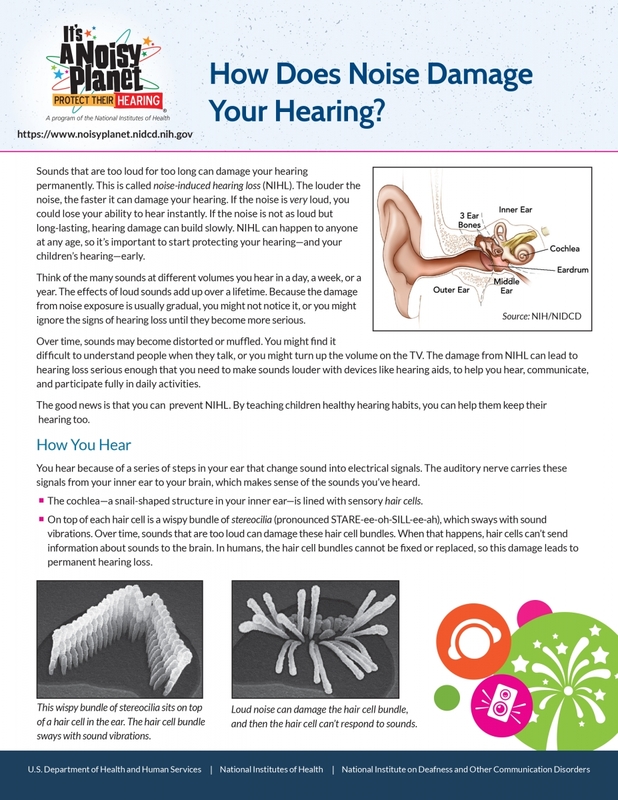 Learn about noise-induced hearing loss (NIHL), how you hear, causes and signs of NIHL, and how you can help kids protect their hearing. Tips to encourage preteens to use hearing protectors. Find out how loud is too loud. 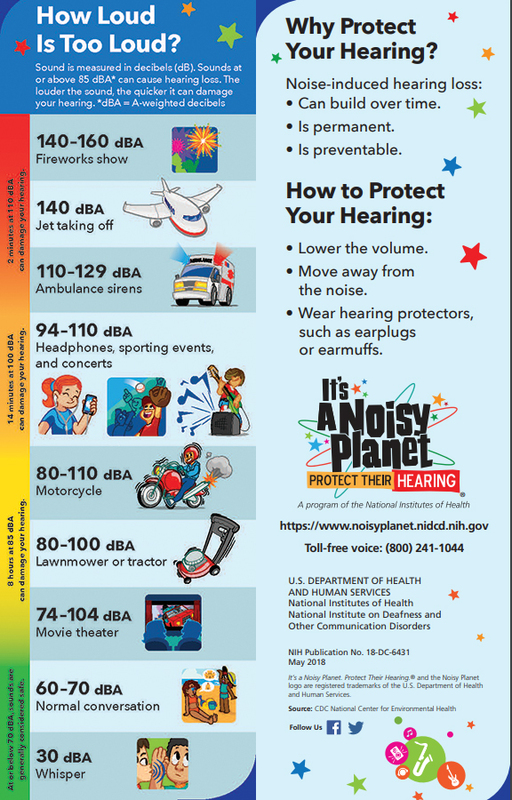 A poster that discusses why and how to protect your hearing.